Save Energy, Save Money, Live Better! With the colder season bearing down on us, there is a trend of people trying to devise a way to lower their heating bill this winter/cold season. The way to lower heating bills is to use less heating fuel. For most, this means use the furnace less. Natural Gas Fireplaces and home energy: Does using a natural gas or electric fireplace save you money on your energy bills? But how do you use the furnace less without feeling cold around the house? Turning down the thermostat obviously uses less fuel (sometimes) because the furnace runs less. But that isn’t always practical, because it may leave you feeling cold. And uncomfortable. So, the obvious alternative is to find another source of heat that will (hopefully) be cheaper than the alternative of burning more fuel. Fireplaces normally are notorious wasters of home energy. Rather than adding heat and warmth to a room or home, they really take the heat away. This is because of the design of most fireplaces in combination with the nature of combustion. When a traditional fire is burning, it requires oxygen. The oxygen comes from your home, and since the air in your home is heated, this means it is essentially burning heated air. So the energy expended to heat the air is wasted. An electric fireplace relies on a heating element to warm air and a fan to circulate it. They use no fuel, however, they use a lot of electricity. In fact most use between 750 and 2000 watts. They are expensive to operate (depending on how long you run them and how big of an area you need warmed) if you aren’t careful. And most of the time, on a cost per unit basis, it is cheaper to use a natural gas appliance than an electric one. 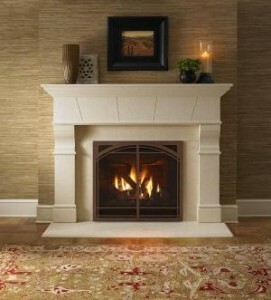 There are 2 types of gas fireplaces (actually there are more, but I’ll cover 2 here.) There is a vented gas fireplace and a ventless appliance. Both have merits. Ventless fireplaces or units are nearly 100% efficient (but lose efficiency over time) and don’t require venting to the outside because of the near perfect efficiency. This means that they are excellent heaters. However, they have their drawbacks. They often give off a terrible odor, a lot of water vapor, and can be troublesome to those with allergies. Additionally, aside from the aesthetics of the units and flame itself, they are fickle and somewhat tricky to run efficiently because of the air flow demands around them. Vented gas fireplaces are sealed and have blowers to help capture the heat and redirect it into the room. They are marginally good heaters, but their efficiency ranges from 50% to 75-80%, no better. They must be vented to the outdoors, because their combustion is far less than ventless units, and release carbon monoxide in addition to the water vapor. However, there is no odor or water vapor released inside the home. Both vented and ventless units can put out between 9000 and 38000 btu, making them relatively good room or area heaters. Air circulation is critical, obviously, if you want to avoid using a furnace and rely on these units instead. They are great in power outages, because they use no electricity, thus, they can remain on even as the power is out. Will these units reduce your heating bill in the winter? They might, if used cautiously. Both have the potential to give off a lot of heat, even in a wide open area. An electric fireplace would give off enough heat to probably heat a small to medium sized room that is closed off – otherwise most the heat is probably wasted – and you’d waste electricity doing so. It's cold outside, should I turn on the fireplace or turn up the thermostat? How much money does my furnace cost to run? How much electricty does your clothes dryer use? It’s cold outside, should I turn on the fireplace or turn up the thermostat? Space heaters: How much energy do they use? Should you buy a used air conditioner? Should you buy a new air conditioner or use your older one? Thanks for the great post. It seems to me that for the most part, fireplaces aren’t great in terms of energy conservation. Now that it’s spring, people should also remember to turn off their gas fireplaces’ pilot lights until the fall rolls around again. Keep it green! Utility Bill Busters is a free resource for saving energy and saving money on energy in and around your home. With free DIY tips, professional energy saving tips that covers all your utilities, you won't find a better resource for saving on your energy bills. We've been helping you save money on your energy bills since 2003. Find out about home energy, free energy saving tips, energy audits, and simple DIY home repairs that make your house more energy efficient and comfortable. What is your preferred summer drink to keep cool? Need High Quality, Affordable Blog Articles? RJ on Can you save 50% on your fluorescent lighting costs if you remove half your lights? » How Much Is a Furnace on How much money does my furnace cost to run? All articles copyright their respective owners. Site by Headphase Media, LLC.